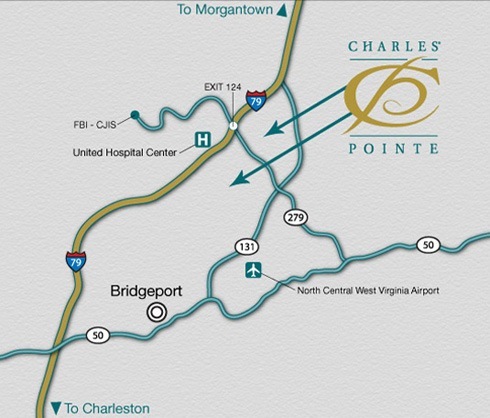 Charles Pointe is conveniently located along the I-79 High Tech Corridor just 30 miles south of Morgantown and within minutes of the North Central West Virginia Airport. Northbound on I-79 - Exit 124. Turn right at the end of the off-ramp onto 279 east. Drive uphill ¼ of a mile and the main entrance into Charles Pointe will be on your left. Southbound on I-79 - Exit 124. Turn left at the end of the off-ramp onto 279 east. Drive uphill .6 of a mile and the main entrance into Charles Pointe will be on your left.